Collect light from the experiment with spatial, temporal and spectral resolutions. Enable light collections within a broad spectral range (visible, UV, Vacuum UV, x-UV, x-ray). Maximize the light collection efficiency. Use of different light collection systems - mirrors, lenses, beamsplitters, polarizers, optical fibers. The light is dispersed using gratings (visible, UV, VUV), crystals (x-ray), or Ross filters (x-ray). The light is detected using: photomultipliers or with time dispersers (streak cameras) coupled to CCD cameras. Measurements of atomic and ionic spectral line emission from the x-ray to near IR wavelength range. 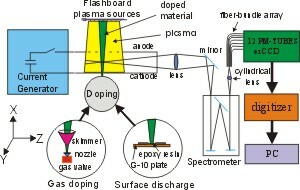 Determination of the non-equilibrium plasma conditions. Measurement of the electromagnetic fields. Experimental studies of the density, temperature and velocity distributions of atoms and ions including the charge-state distributions of different ions. Investigations of electric and magnetic fields inside the plasma and their interaction with the non-equilibrium plasma. Study of the onset of turbulence in current-carrying plasmas. Study the physics of dense plasmas and their interaction with radiation.